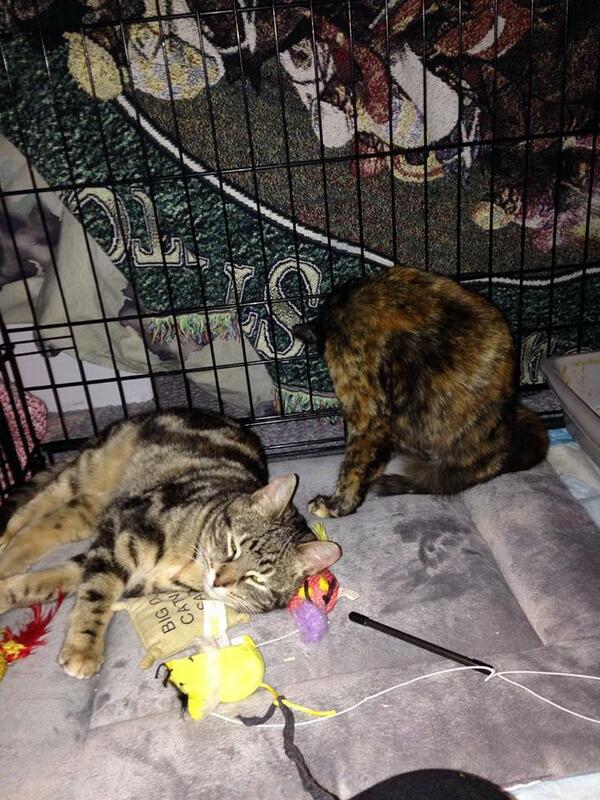 Sonia trapped Yoshimi and got her admitted into Felines & Canines. I posted Yoshimi’s story last week, and then she was adopted the next day. 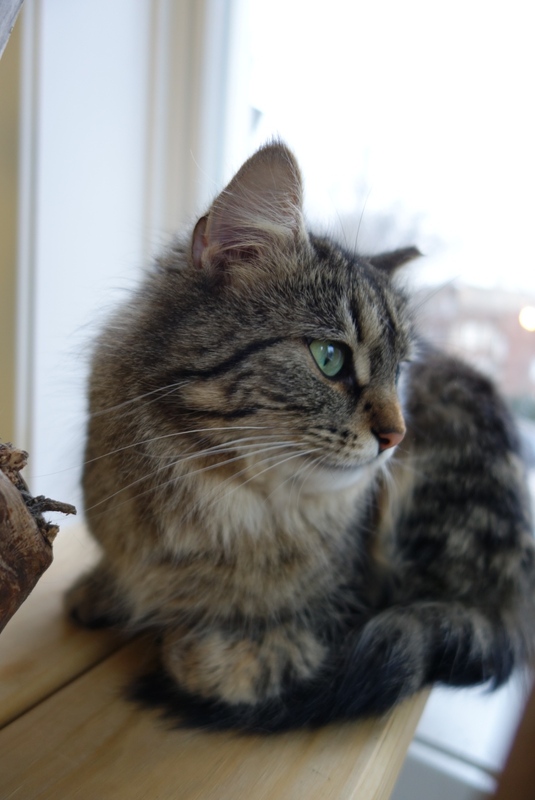 She was at Felines & Canines for just 10 days before she found her new forever home. Sonia has been caring for Yoshimi outside since last summer. Sonia is moving from Chicago at the end of this month and was worried about about what would happen to Yoshimi when she left. In the meantime, Yoshimi became very friendly towards her, and when Sonia brought her into the clinic, she discovered that Yoshimi was already spayed. She had been someone’s cat at some point. 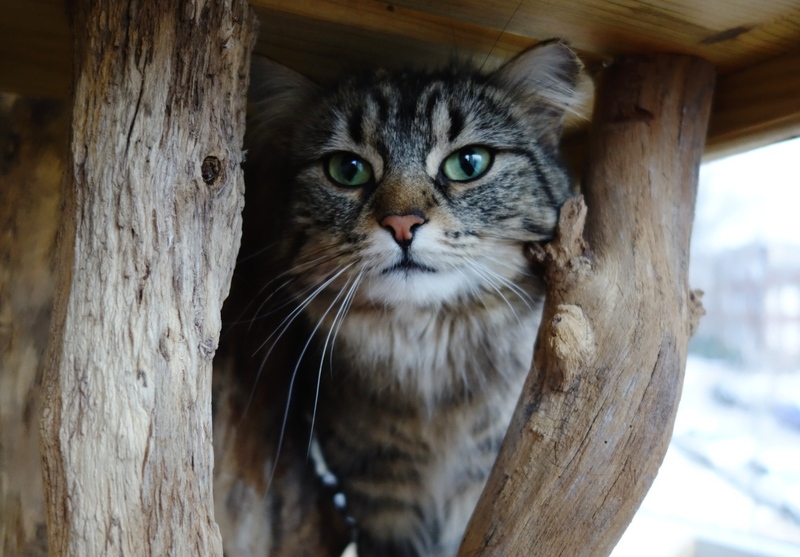 Sonia visited Yoshimi a few times before she was adopted and took all of these gorgeous photos. Yoshimi is incredibly photogenic. 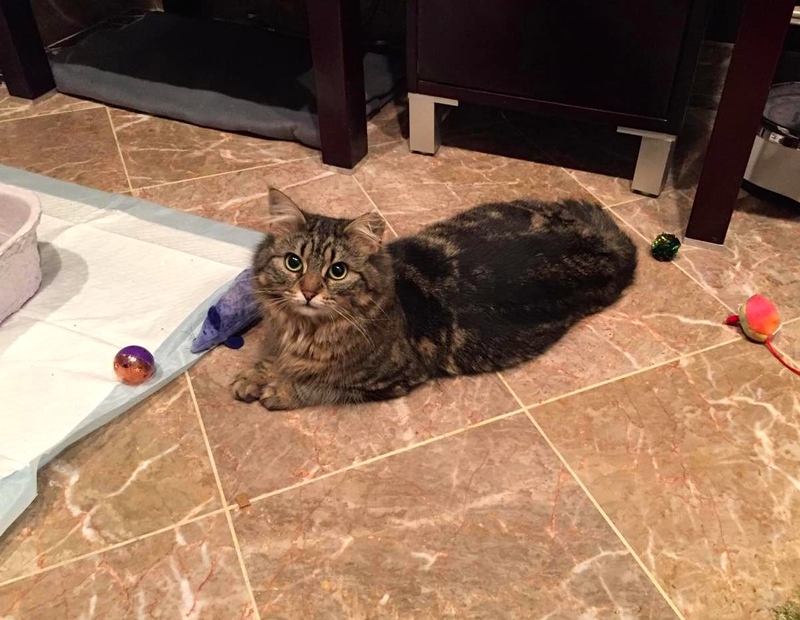 Thanks to Sonia and Felines & Canines for rescuing her off the street! 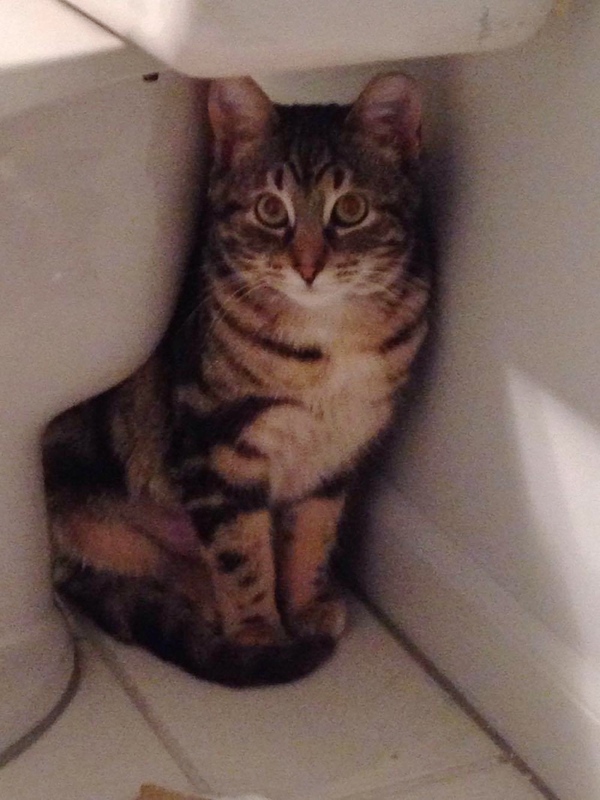 Congratulations on your new home, Yoshimi! 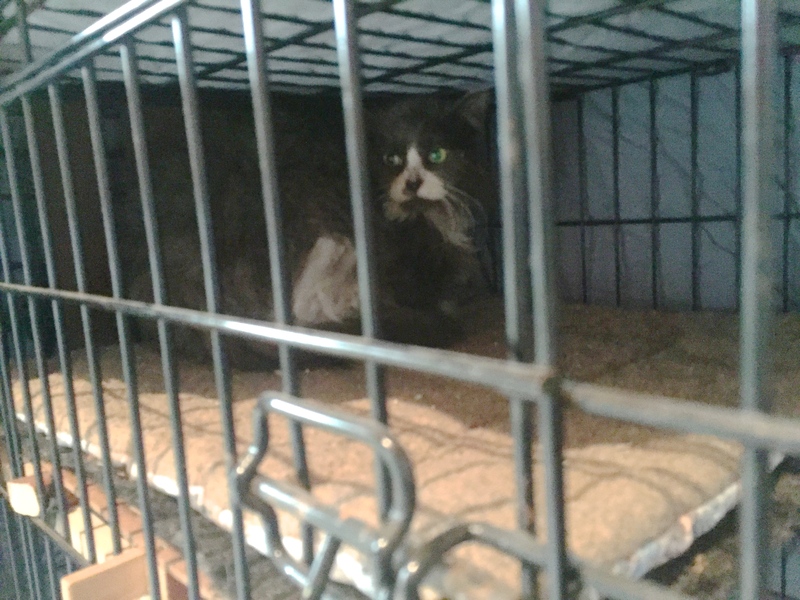 Maxfield made a full recovery from his neck wound and checked out of my feral recovery lounge today. I finally was able to get a decent photo of him when I transferred him back into the trap from the crate today. He was aggressive and growled the entire time, which means he’s feeling a lot better. Just look at him! Look at that face! That glower! I love him and the feeling is not mutual. 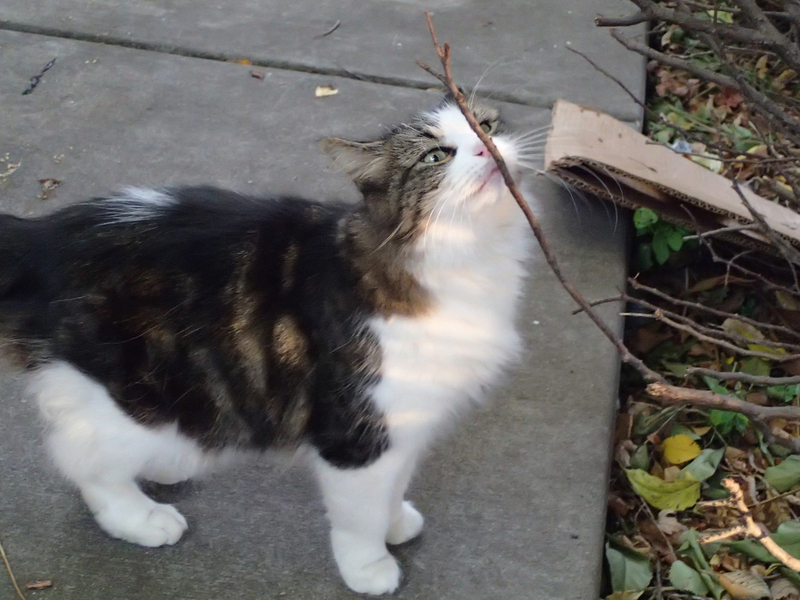 Feral as F**k. My favorite kind of cat, and why my TNR obsession started. Sometimes they still need our help, but we’ve failed them so much. They still deserve dignity, but we don’t deserve their gratitude in return. He cleaned up his face and started grooming, which is also a good sign. His face was banged up and he was sniffling last week. He was getting bored in the crate as I found it trashed every morning. He would use the litterbox, but then shred the puppy pads and pull in any towels covering the trap and crate. It was time for him to go back out. 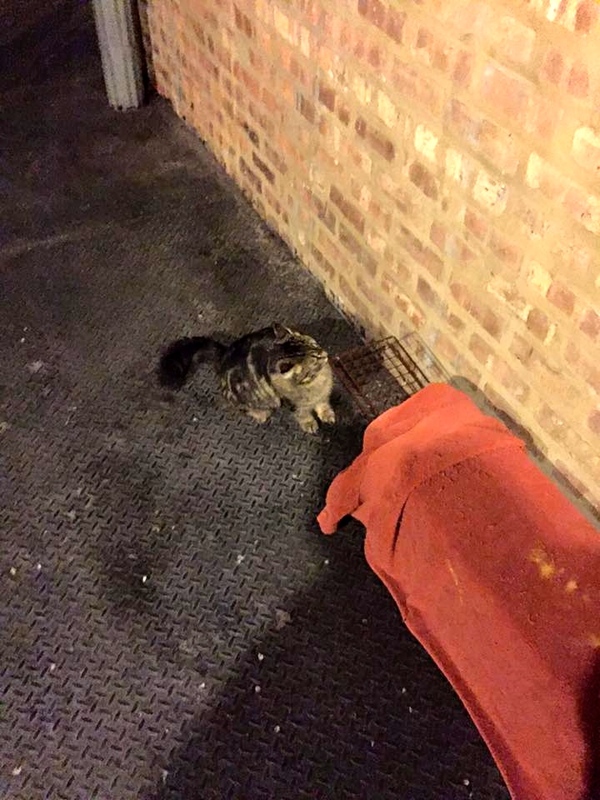 George from Chicago TNR picked him up. 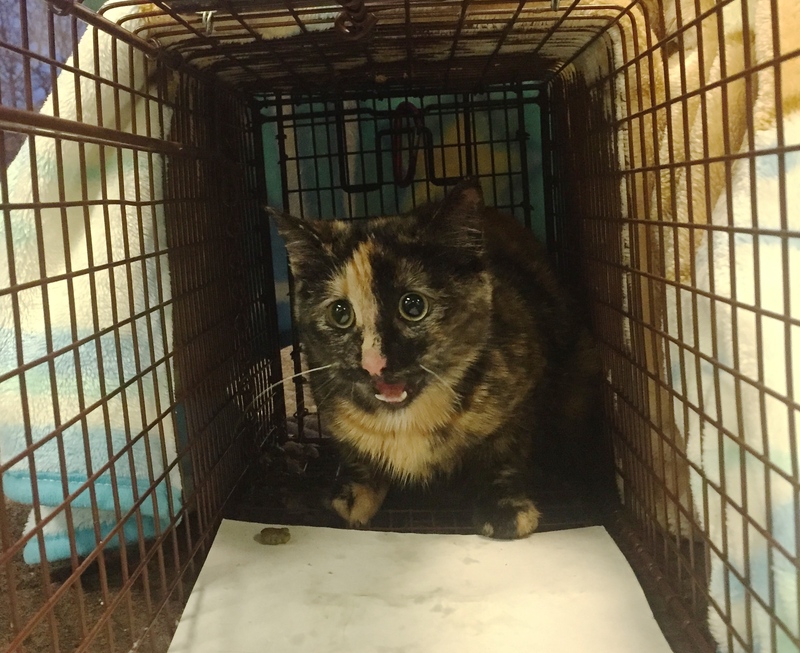 She had five other cats in her Feral Mobile to return back to various sites. These two cats were going back with Maxfield to their site in West Englewood. They are most likely siblings or offspring of Maxfield. Same glower. Same long hair. Same feral stare. At least these guys weren’t wounded. We have no idea how Maxfield was injured, but I’m so thankful that George trapped him in time to treat it. 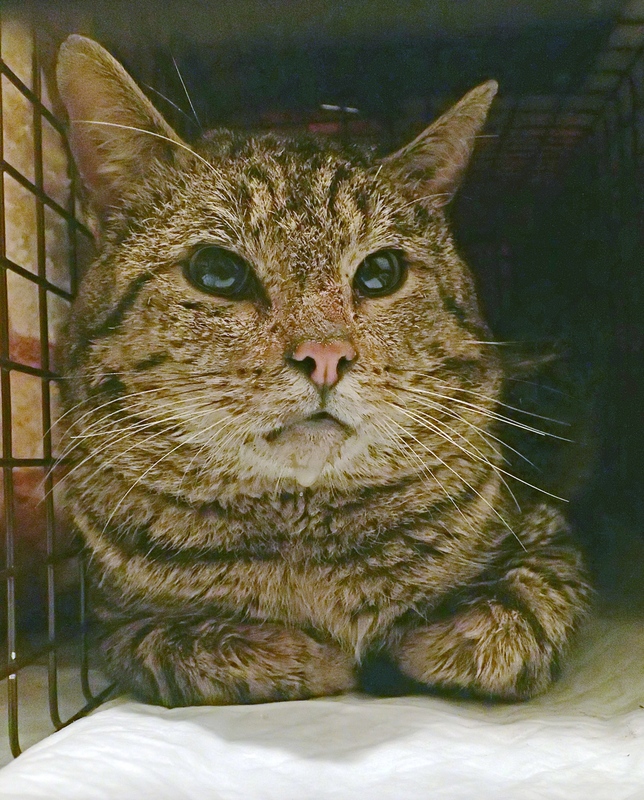 This handsome brown tabby boy from another site is pretty friendly, and George was bringing him back to a south side feeder who is willing to work with him for socialization, and possible placement into a no-kill shelter in the future. This orange guy is very friendly and George is trying to get him into a foster home. He’s friends with this other orange guy, who’s a bit more feral. Godspeed, Maxfield, and all of you beautiful feral creatures! 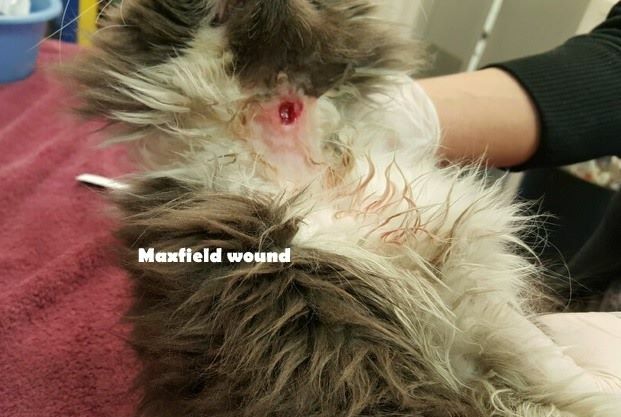 Update on the Injured Englewood Cat: Maxfield is on the Mend! 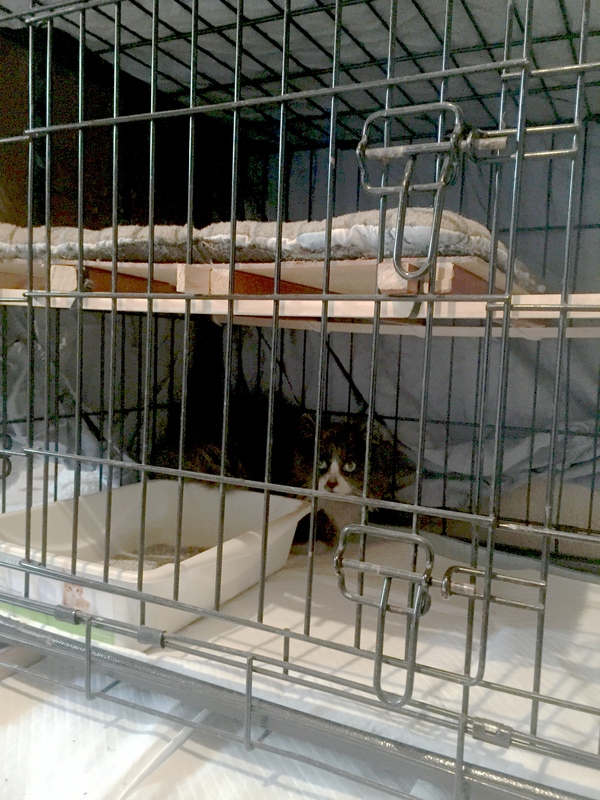 Maxfield discovered the upper “bedroom” level of his feral recovery lounge a day after I set him up in the crate. He is recovering from a deep neck wound treated since last week. He’s supposed to be kept confined at least 7-10 days to make sure infection doesn’t set in. So far he’s doing great in the lounge, but still acting very feral. So, I can’t get a better photo of him than this. 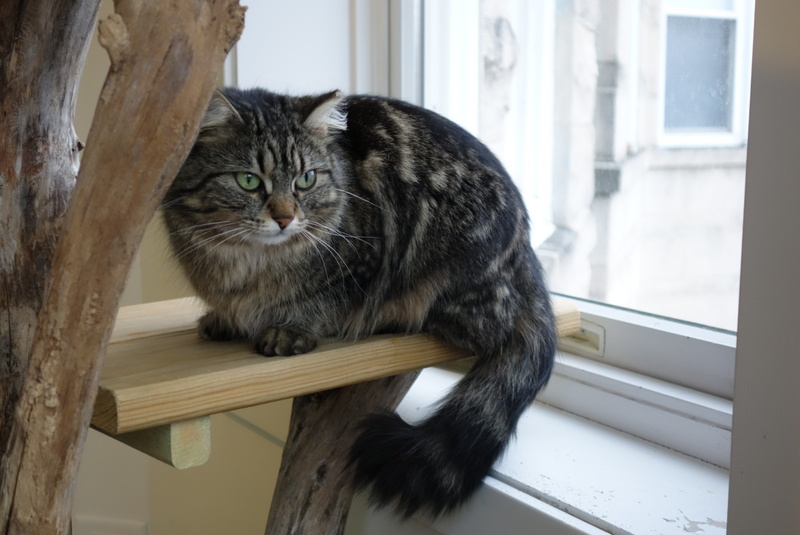 He’s a really beautiful long-haired grey and white cat. All cats in the recovery lounge end up sleeping on the upper level, thank goodness. The litter box is on the lower level, and the attached trap has all of the food and water he needs. Maxfield is still acting absolutely feral towards both me and Jim. He tries to bolt, strikes out aggressively, and growls and hisses at us the entire time. It’s pretty awesome. I absolutely adore feral cats like that as they are letting us know with certainty that they want to be free outdoors. 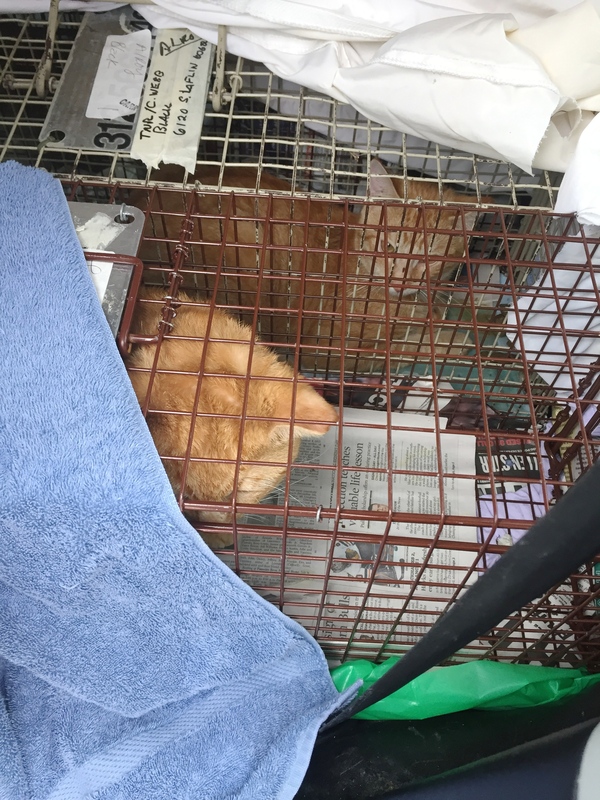 They are why I started TNR in the first place – to stop the feline overpopulation crisis, and to let feral cats live their lives outside with dignity, caring for them when they want it, on their terms. I’m out of town for work this weekend and Jim is caring for Maxfield, making sure his crate is kept clean with fresh puppy pads and newspapers, the litter box is cleaned out, the dry cat food and water dishes are refreshed, and he gets all of the wet cat food with Lysine that he needs. Maxfield has some diarrhea which seems induced by stress only so far, and a very good appetite. Hopefully he will be ready to be returned back to his colony site in West Englewood this week. 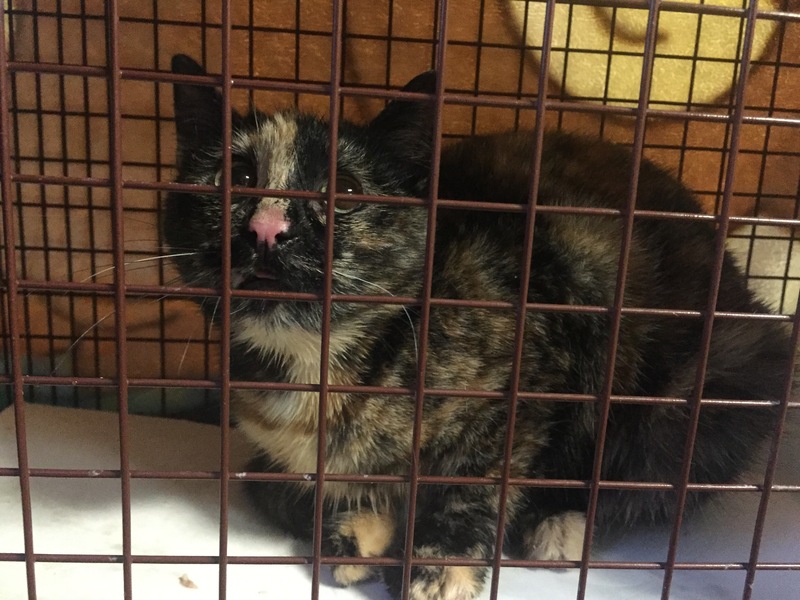 Jeeves is the 20th cat trapped at the Pallet Colony this year. And there are still more to be TNR’ed. Joann trapped Jeeves last week. You can see he’s drooling, most likely from stress, and not feeling well in general. Joann took him to PAWS Chicago for his TNR surgery, where they discovered he had a wound, most likely from a bite, that required stitches. As part of their TNR package, they cleaned and stitched the wound, and gave him a shot Convenia to offset infection. 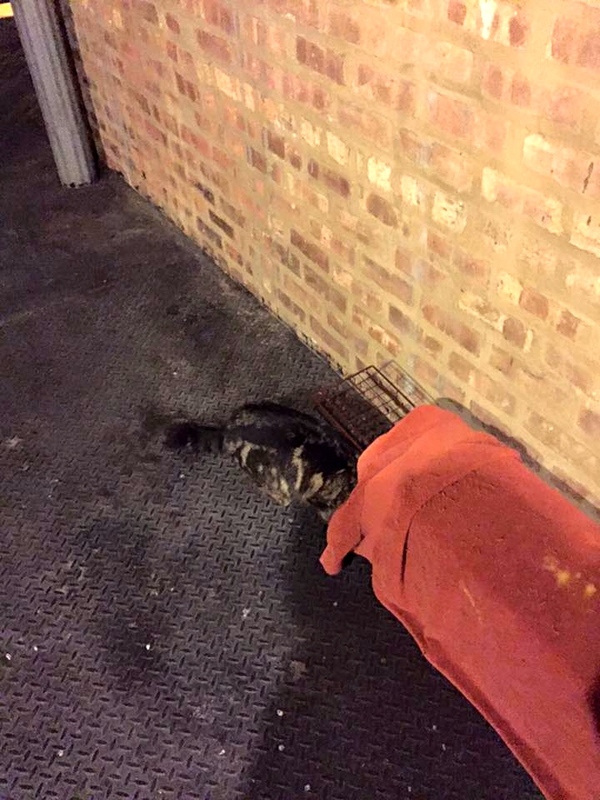 PAWS is the only clinic that will include these services for feral cats in Chicago for free. We are immensely grateful for this service. Jeeves then required just the regular amount of recovery time since he was trapped before infection set in. He is back and happy with his colony. We’ve been really lucky with this colony so far as they have all been healthy and without injury until Jeeves. Also, every cat we tested for FIV/FeLV for shelter admission has turned out negative. When Joann returned him, she talked to Ron, the colony’s main feeder, and saw at least ten cats in his yard. Some were already ear tipped and TNR’d by us, and some were not. She also met Ron’s landlord, who brought out his pet cat to show Joann. This cat also needs to be neutered. They knew all about Jeeves, and said he liked to fight. Typically tom cats like this have those big old cheeks, and are fighters since they are looking to mate. Jeeve’s fighting days are over as he is now neutered, and he will calm down once his testosterone levels go down after his surgery. 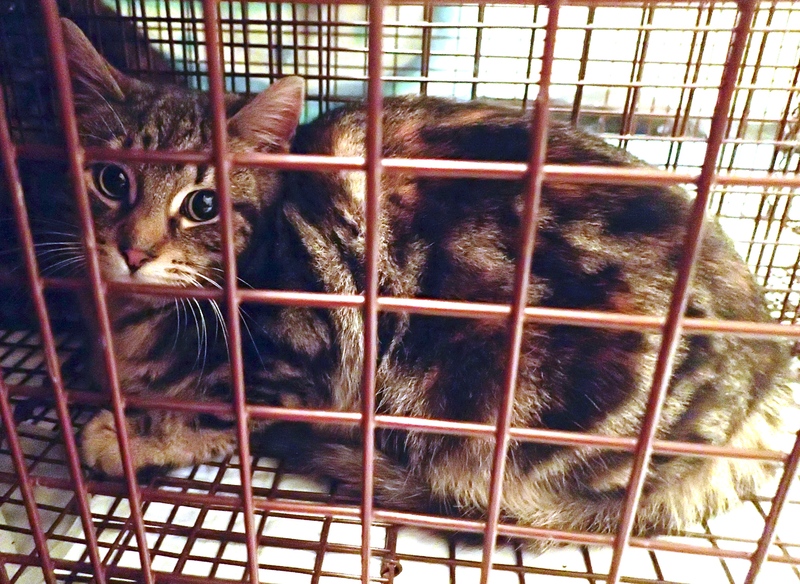 Joann and I will go back to the site this week with multiple traps to see if we can get more cats. Most likely we’ll be also accidentally trapping ear tipped cats, which is why it’s great to have extra traps on hand for these projects. 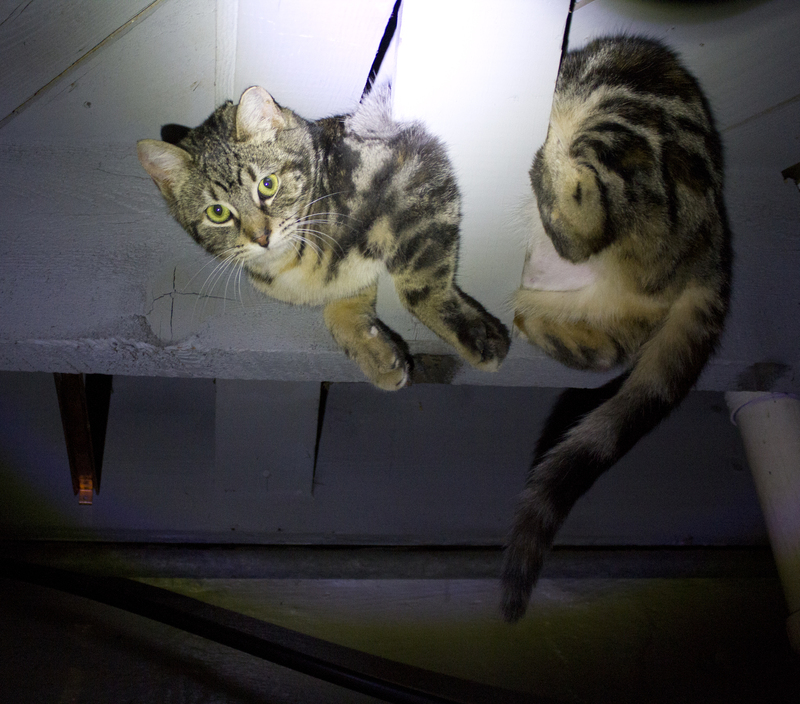 Sometimes you trap outdoor cats that are already fixed. That happens to all of us who do TNR at some point. But it happened with my friend Sonia with the FIRST cat she ever trapped last week. Yoshimi has been coming to her place since last summer for food. 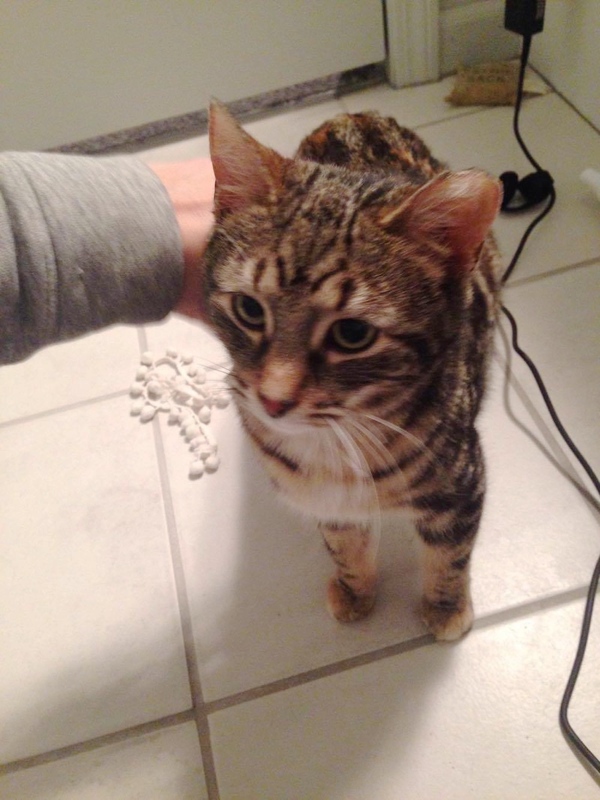 Yoshimi got bolder and bolder, walking up three flights of stairs to get to Sonia’s door. Then this winter she became friendlier, and started rubbing up on Sonia, and asking for pets. 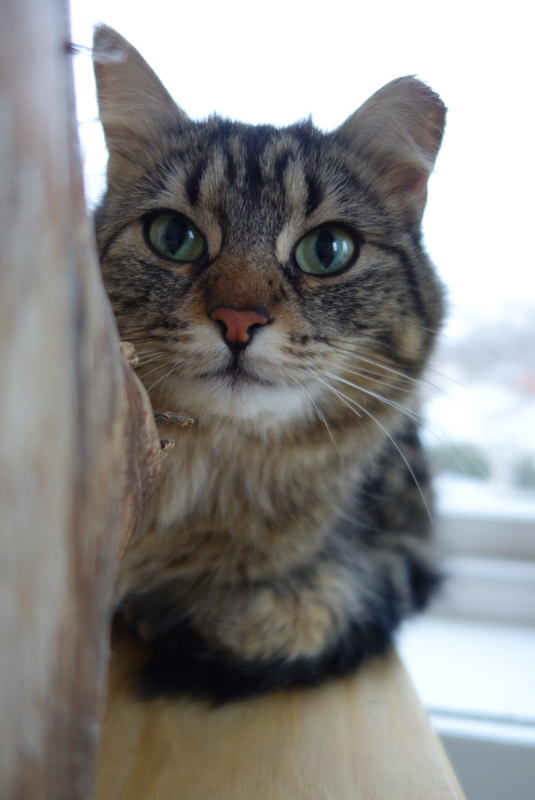 *And Adorableness Alert – Pretty much ALL photos of Yoshimi are AMAZING. And Sonia took all of these, with permission to share here. So Sonia came by to borrow a trap from me and see how it works. and she pretty much went right in immediately. Doesn’t she look pleased? She meowed A LOT in the trap. That was yet another sign that she is friendly. 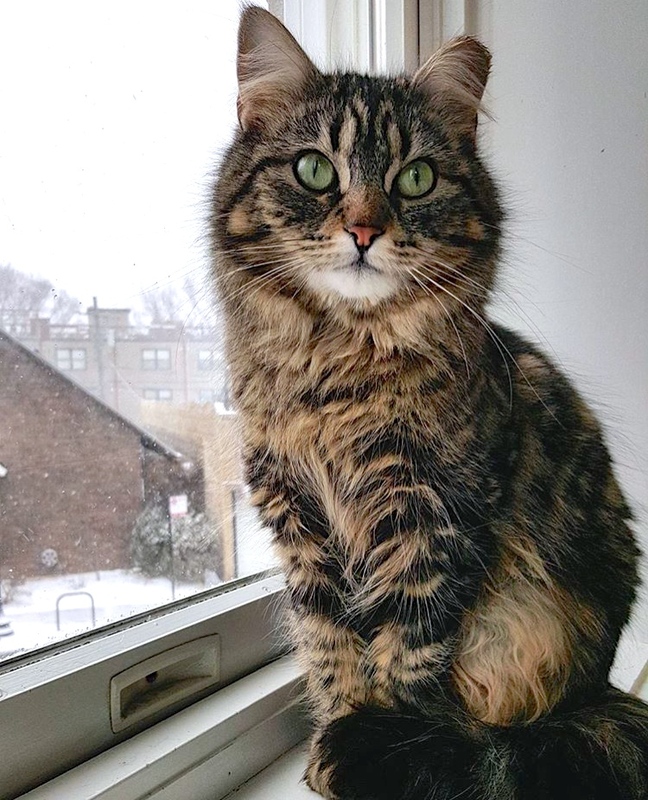 Sonia brought her in to PAWS Chicago for her TNR surgery. 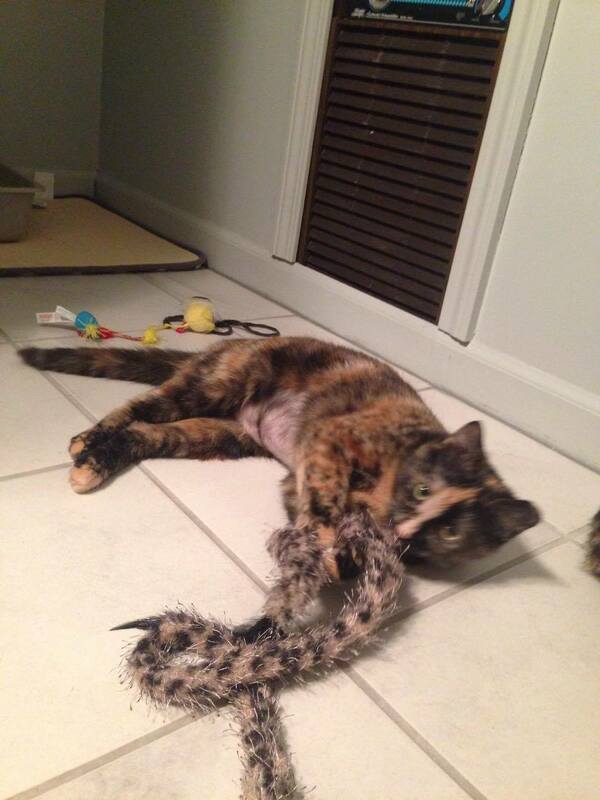 It turned out that Yoshimi was already spayed, and even had a tattoo from PAWS’ clinic. But no microchip. 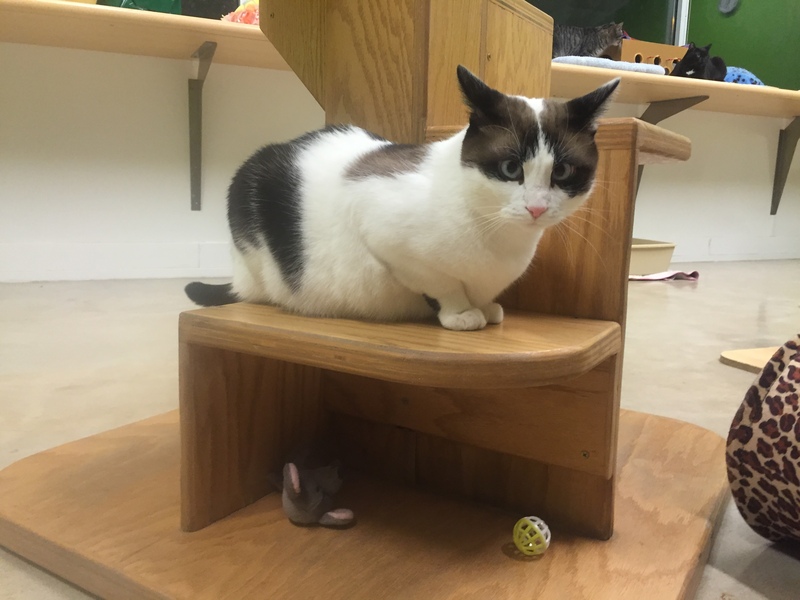 Sonia had no idea who her previous owner was, and at this point, since Yoshimi had been coming to her place exclusively for months now for food, Yoshimi was most likely a former pet cat that was dumped last summer. Yoshimi was very comfortable in Sonia’s bathroom. A lot more comfortable than in the trap. 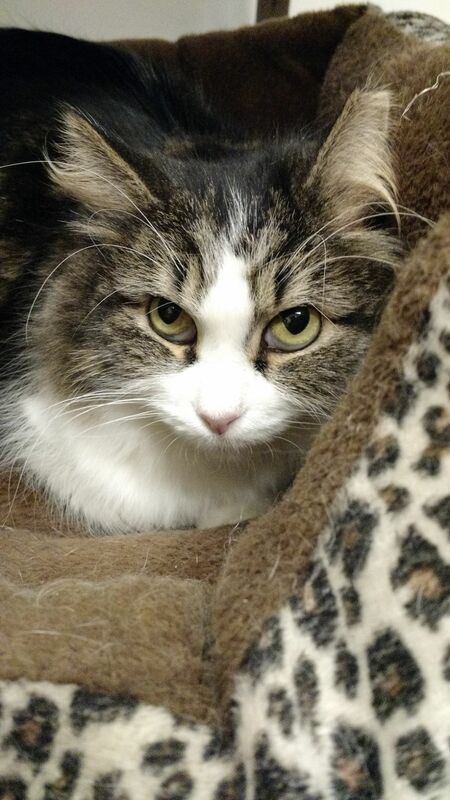 Sonia contacted Felines & Canines who agreed to admit Yoshimi into their adoption program. She’s already available. They shared this photo of her enjoying their window views. 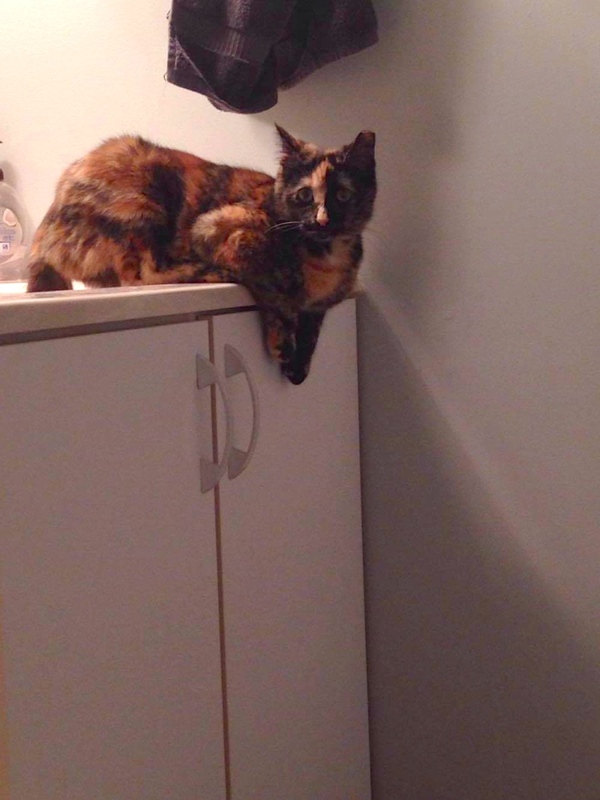 Thanks to Sonia and Felines & Canines for getting Yoshimi off the street, and on her way to her second indoor home! Is that really a thing for socializing feral cats? Well, no, but it should be. 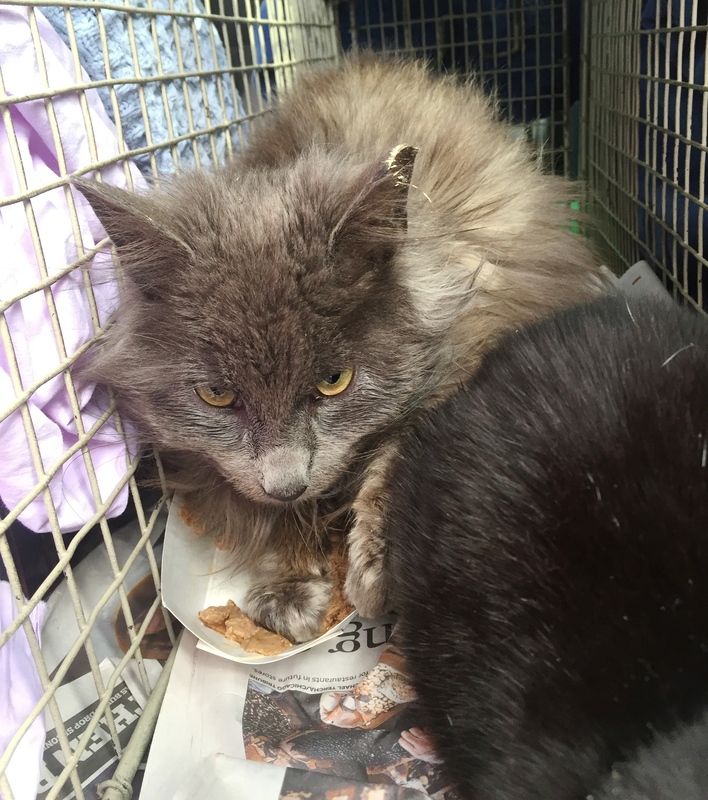 This past year I’ve met some really remarkable people who are willing to try to do everything possible to help us help bring more cats off the streets. Pinky and The Brain are perfect examples. We trapped them popping in and out of outdoor drain pipes at the Pallet Colony in January. Pinky’s nose was so pink at the time. The temps were brutal when we were trapping her. She was incredibly vocal, so we thought immediately she may be friendly. The Brain’s trapping was accidental. We placed a trap around the corner and found her in it at the last minute. It was pretty funny. We were rounding up the traps, thinking we were going to pack it up for the night, and Joann found her. Isn’t her marble coat gorgeous? You can really see it in this photo. 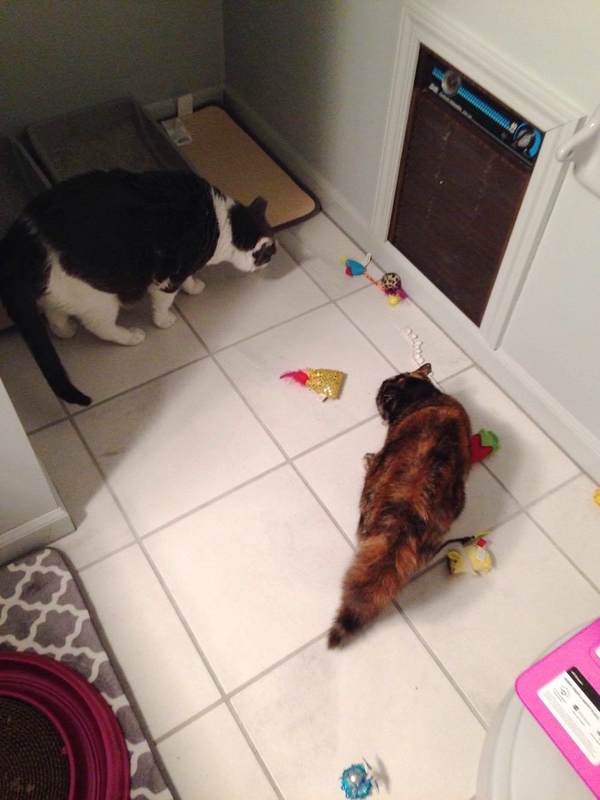 They are older kittens, bonded, most likely from the same litter, and needed some socialization in order to be admitted into a no-kill shelter. 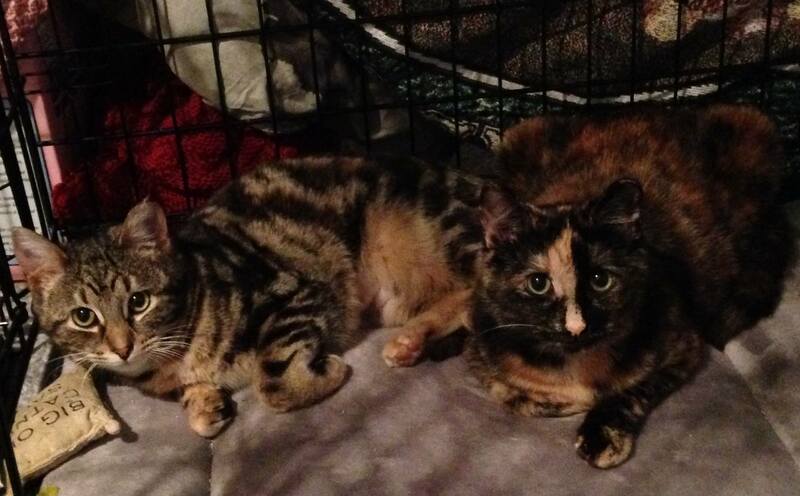 Joann insisted on giving them a chance immediately after their TNR surgery at PAWS Chicago. She took them home to foster and socialize, and later for further vetting. They were shy, but still did well around her. They purred and wanted to be pet. Problems only came about when Joann would try to get them into pet carriers for transport and vetting. At one point, The Brain got out and went straight for the rafters in her basement. Robin F. agreed to further socialize them. We met Robin last fall when she took the KFC Colony kittens to be fostered. She and her family are amazing at showing cats and kittens the good life indoors. So, thus explains the title of this post, the Fischer School of Feral Feline Socialization took on the case of Pinky and The Brain. 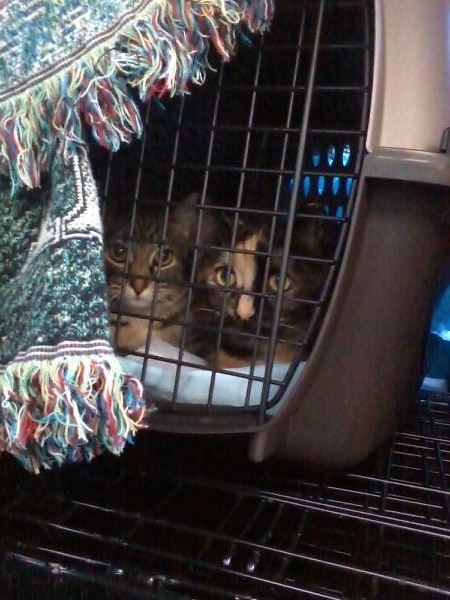 Considering at this point they came from outdoor drain pipes, to the clinic, to Joann’s basement, to vet appointments, and then now to Robin’s house, all within long car rides in traps and carriers, Pinky and The Brain were doing remarkably well. 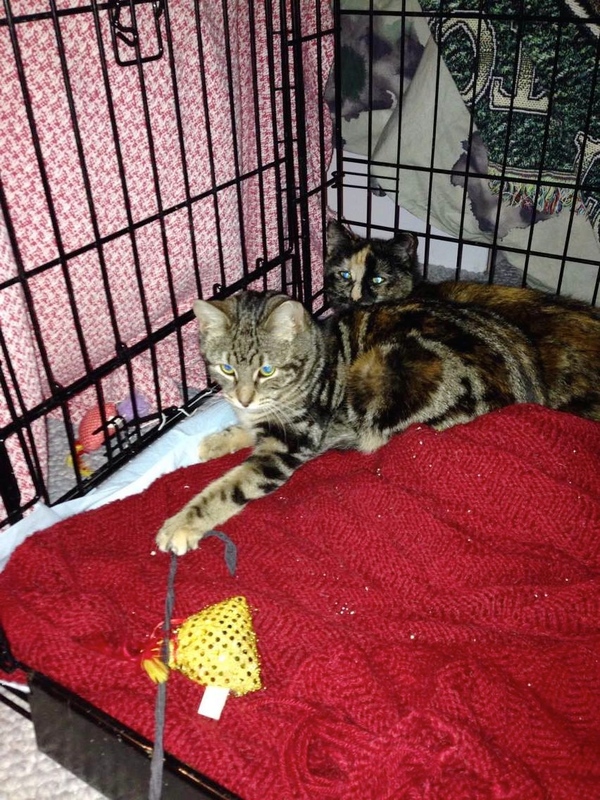 They were first crated together in Robin’s foster room, where they slowly learned to play. And then relax. And then strike a pose. Eventually she moved them into their own small room, her bathroom, where they could roam more and get comfortable. The Brain was a bit shy at first again. And then she got used to it. Pinky was the same way, shy at first. She also wanted to get to know Robin’s other cats. And then they were totally comfortable and acted like typical indoor cats. 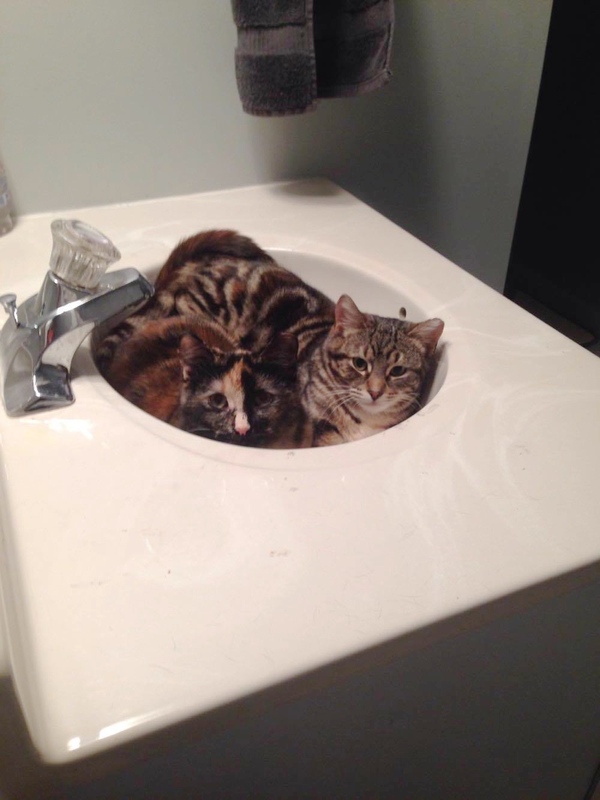 You all know about cats in sinks, right? Joann has them back at her place now, and said they are rolling over for tummy rubs. Next week they have an appointment for possible admission into PAWS Chicago. Fingers crossed they will be admitted! 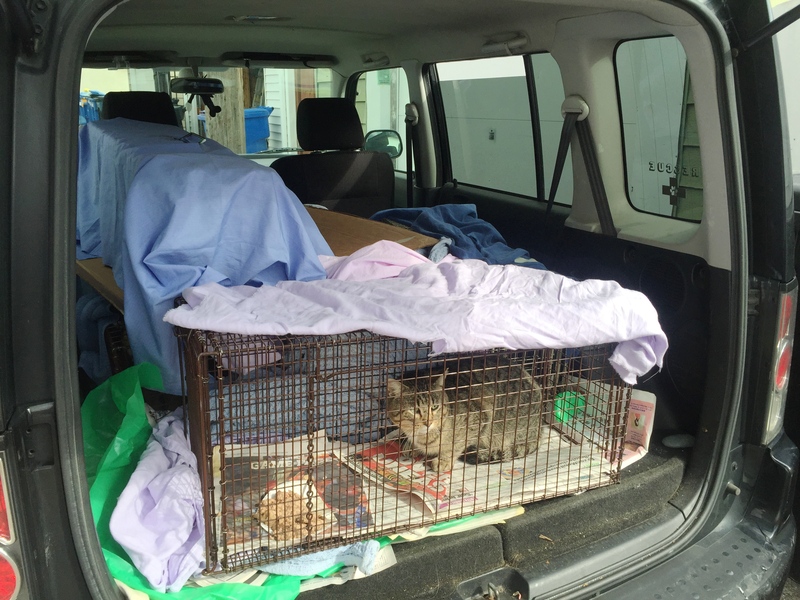 Maxfield was trapped in Englewood this week and brought into PAWS Chicago’s clinic for their TNR package. They found a horrific wound on his neck. 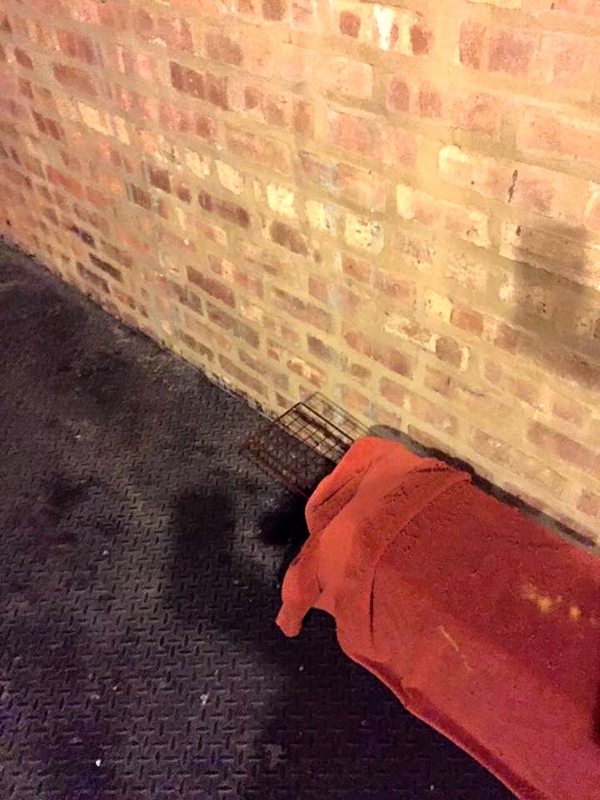 Georgie from Chicago TNR and Cynthia trapped about a dozen cats in this particular alley so far. 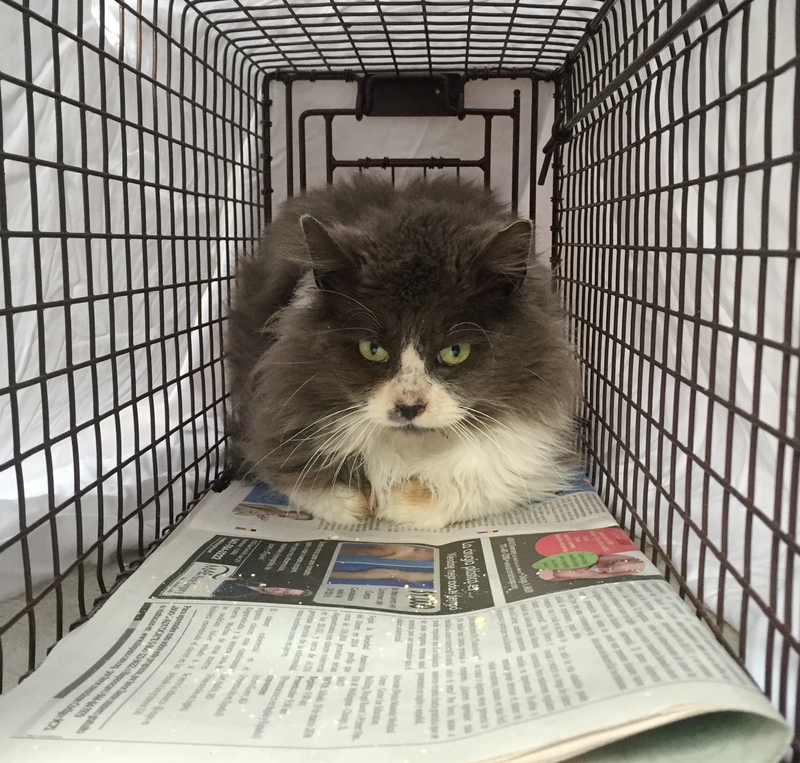 Maxfield was one of them, and the clinic discovered his injury while under anesthesia for his TNR surgery. This was most likely caused by an abscess from a bite wound. Per his paperwork, there was crusted hair over the wound, so they cleaned it up. Then he was given a shot of Convenia antibiotics to offset infection, and they recommended recovery for 7-10 days. 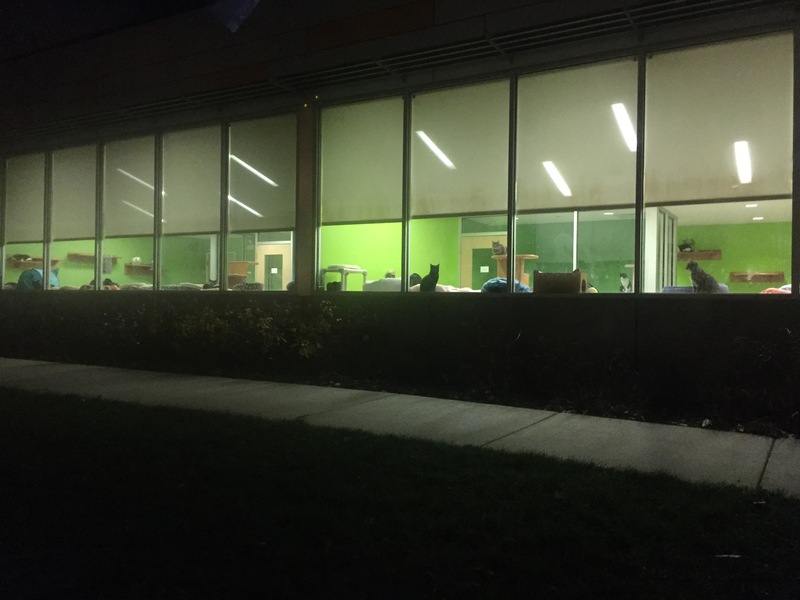 PAWS Chicago performed this medical service free of charge. They are the only vet clinic in the Chicago area who offers this to colony cat caregivers and we are all so thankful to have this resource in the city. I offered to recover Maxfield for George as soon as I saw his injury. 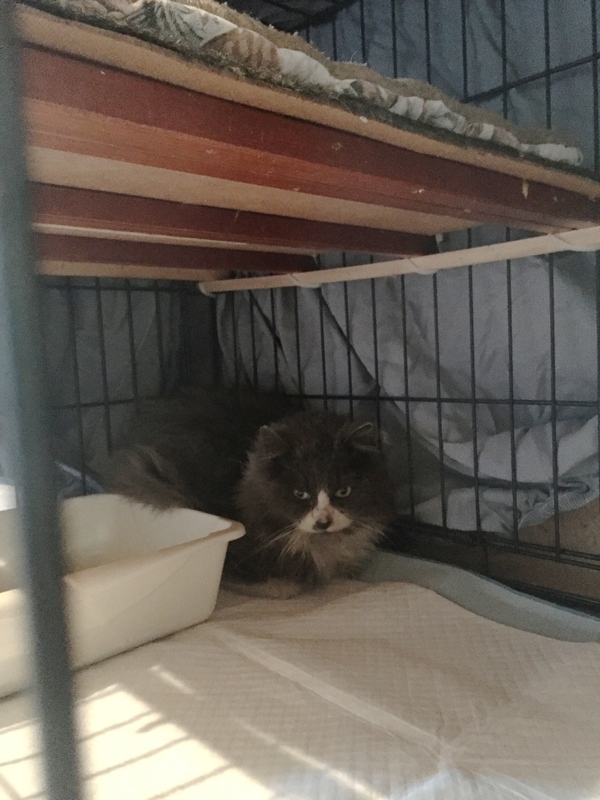 Her foster room is currently occupied with a friendly cat from the same alley that she is trying to place into a rescue. 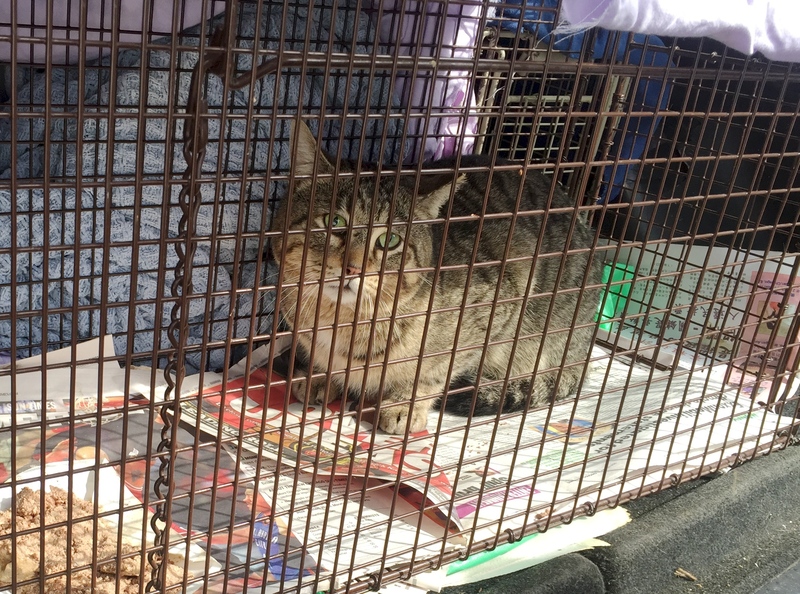 A few years ago my friend, Dave H., gave me a dog crate that attaches to a trap to safely recover feral cats that need to be confined for an extended period of time. Dave invented this set-up and we call it the feral cat recovery lounge. It’s become to be an invaluable resource for several cats I’ve recovered. 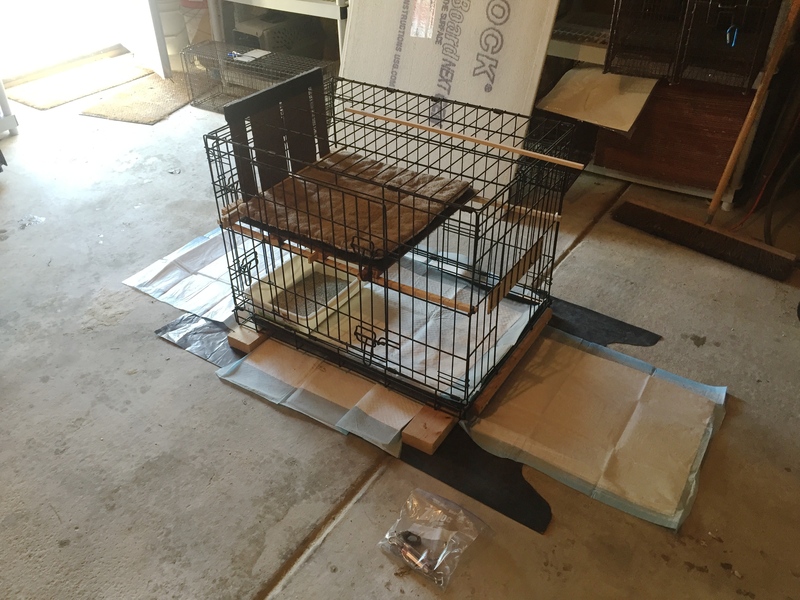 Once you attach the trap to the crate, you cover the whole set-up and allow the cat to freely move from one end to another. 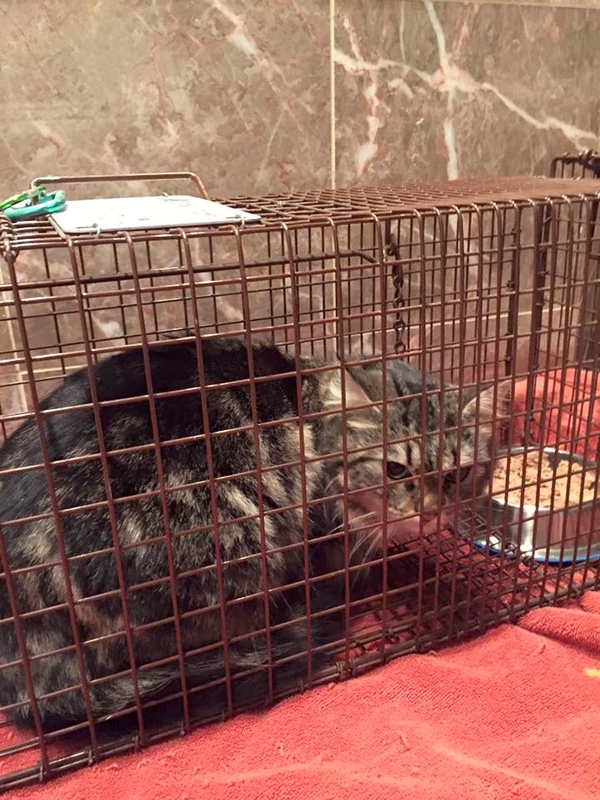 The food is kept in the trap so that it is easy to get the cat to re-enter the trap for transport later. Maxfield settled right in. As soon as I attached the trap to the crate, he bolted into the crate. He decided to wedge himself next to the litter box, and hasn’t moved much since. He hisses, growls, and bolts so far, all signs of feral behavior. He seems a bit congested, so I’ve been adding Lysine to his wet food. 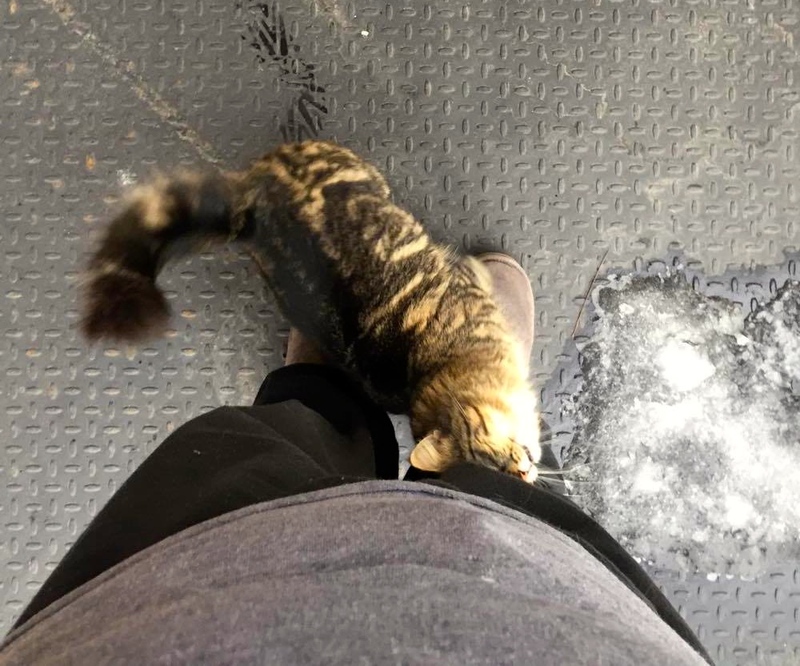 His appetite is good – he’s been eating the wet and dry food as soon as I leave. 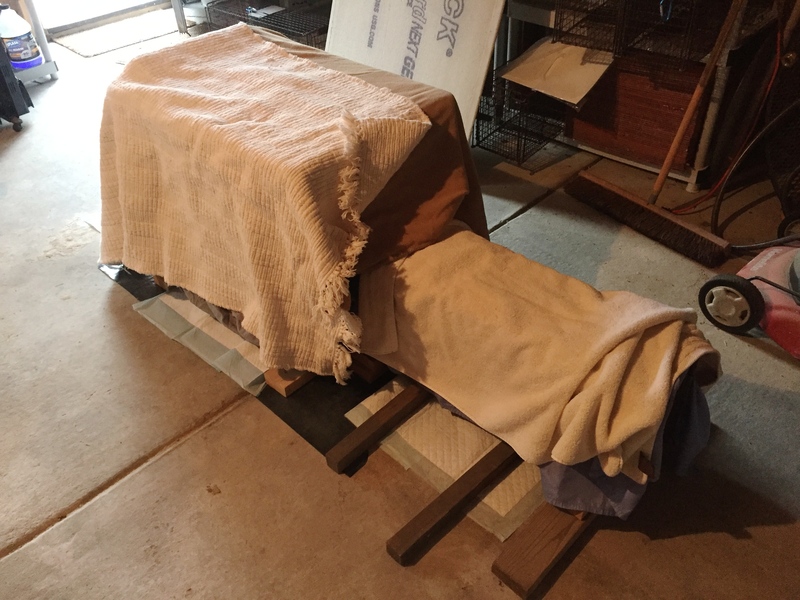 Because the outside temperature is pretty mild, I am keeping him in the garage with plenty of blankets and a heater to keep warm. The crate and trap are elevated off the floor with blocks of wood for circulation and so they are not just sitting on the cold croncrete floor. 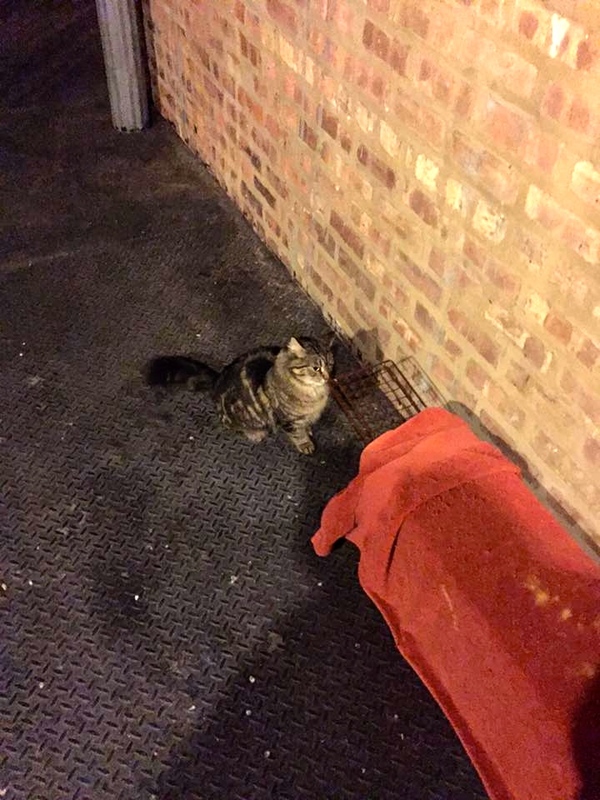 Nonetheless, we don’t want him too warm because we want him to keep his winter coat. He’s doing well and I am hoping tonight he will explore the crate more. There is a second level just above his head where there’s a soft bed for him to sleep and recover. I will keep all of you posted on his road to recovery within the next week. I’d like to thank George and Cynthia for saving his life, for PAWS’ providing his medical care, and for Jim’s help caring for him while I’m out of town for work. Ruby was admitted into Harmony House last November and renamed Hattie. Hattie was a part of the Kitchen Colony, and was way too friendly to stay outside. She would run right up to all of us for pets, starting from the first time we met her. 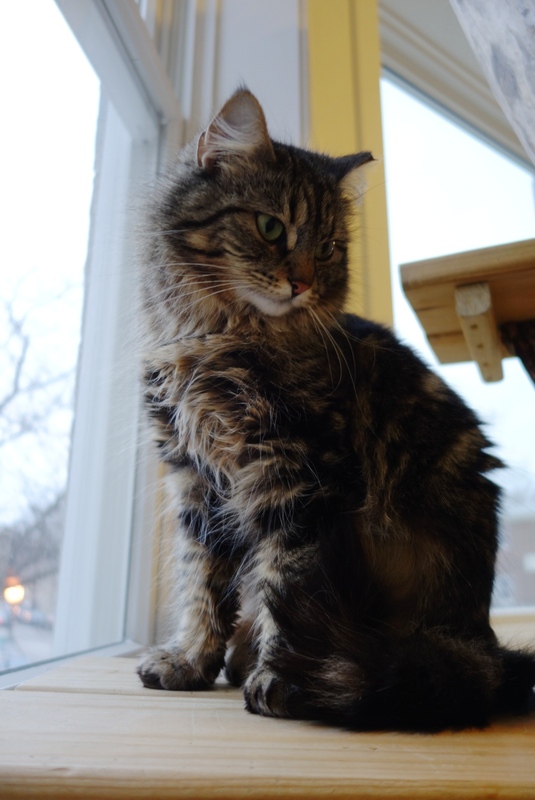 Her long-haired coat is absolutely gorgeous, and it was impossible not to oblige. Someone outside could easily harm her because she was so trusting. The other colony cats would also pick on her, and not let her eat. Patrice, their colony caregiver, was pretty concerned about her well-being. After Joann fully vetted her and fostered her for a bit, Harmony House agreed to admit Hattie into their adoption program. She is still available. 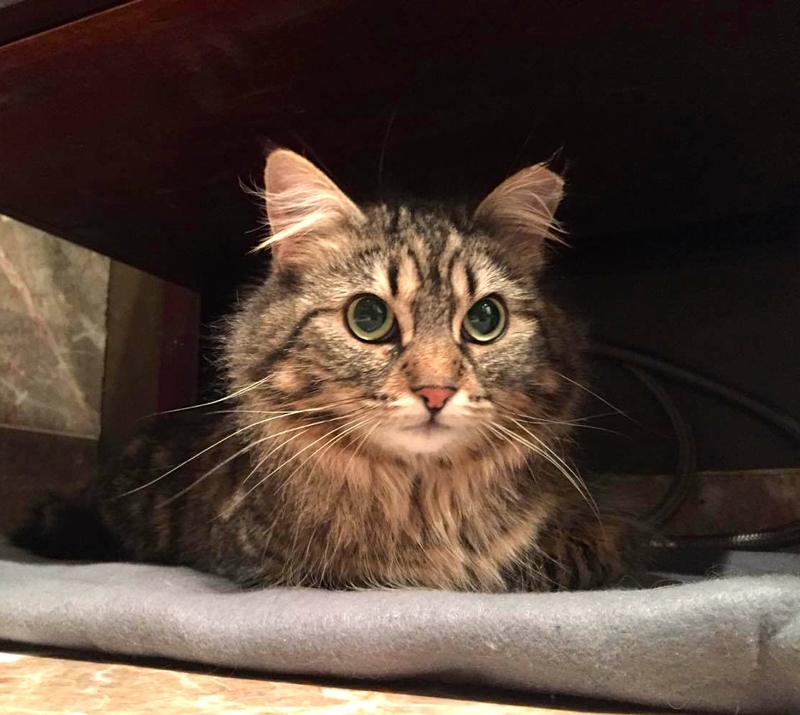 She is pretty shy there, which therein lies the conundrum that caregivers face – cats behave differently in different scenarios. Hattie may be a little overwhelmed by all of the cats and activity around her in a new surrounding. 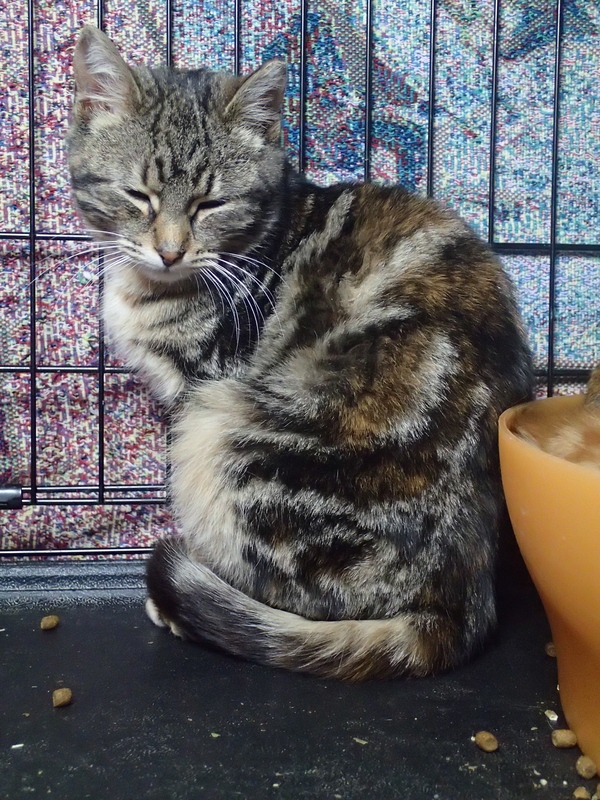 She is cared for beautifully there, and when we visited her, the other cats all wanted to make friends. But you can see Hattie is a bit nervous with all of them around her. Harmony House is a wonderful facility and a really fun place to visit. This cross-eyed cat there caught my eye especially. There’s a beautiful view from the outside as well. We’re grateful to this day that Harmony House agreed to help Hattie so quickly. We hope Hattie will be adopted soon. 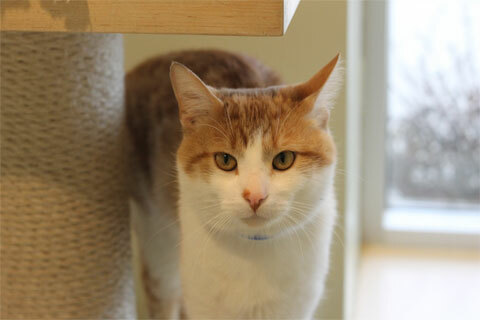 Three cats from the Pallet Colony are now available for adoption at PAWS Chicago. Joann trapped Prince Charming this week. 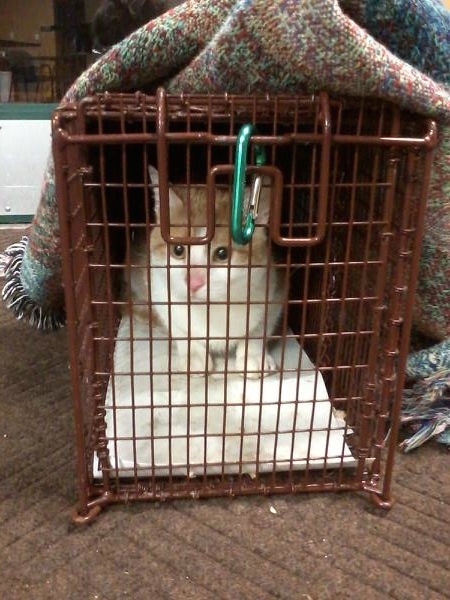 He is the 19th cat trapped at this site, and the seventh cat taken in by PAWS’ adoption program. Doesn’t he look comfortable already on their adoption floor? 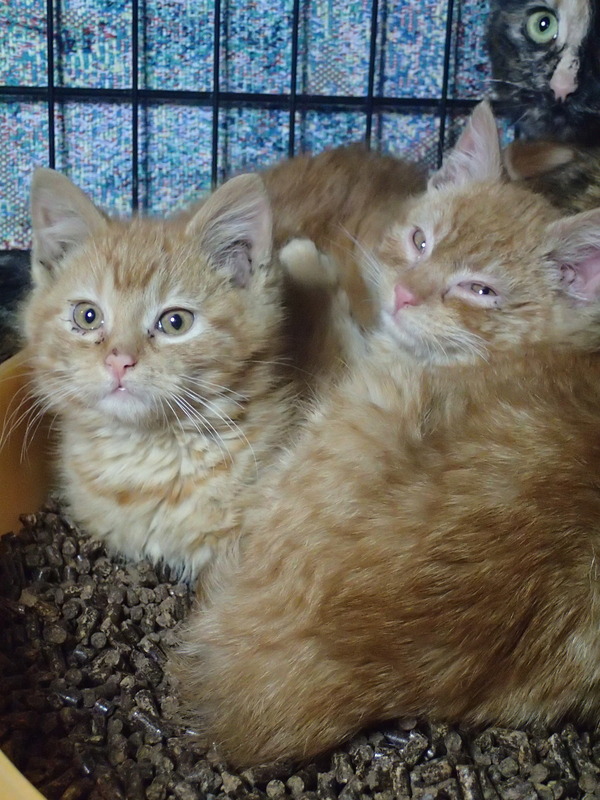 Also, the orange kittens from the first litter we trapped are now available for adoption there. 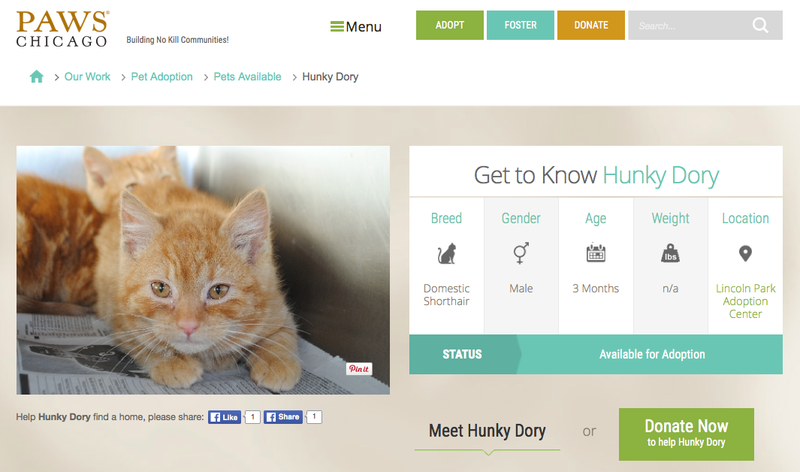 I am sure Hunky Dory and Stardust will be adopted in no time. There are still multiple cats to be trapped there and this colony is a work in progress. 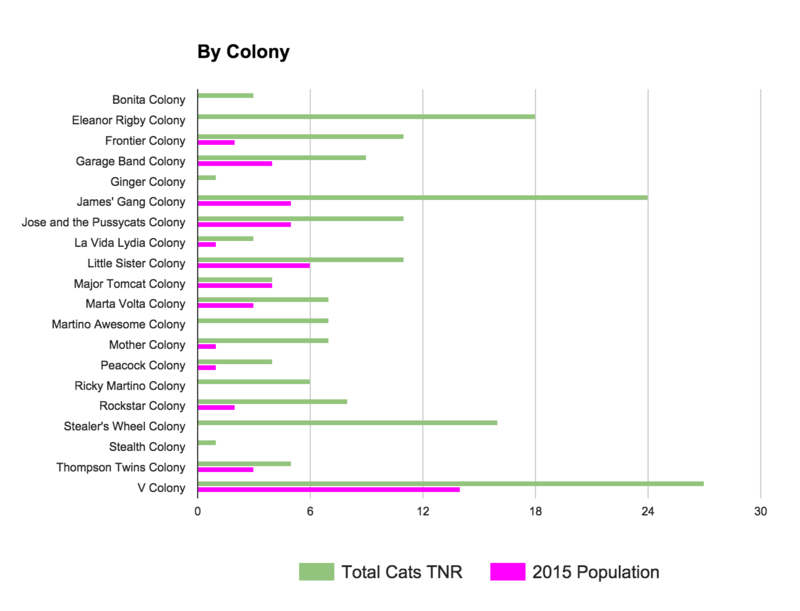 Since 2007 I TNR’d 183 cats from 20 colony sites within one square mile around me. Today there are only 51 cats from that total left outside. That is a 72% reduction rate in nine years. I am very happy with these numbers and track them carefully. I visit these colony sites and their feeders all the time to make sure everyone is doing well. 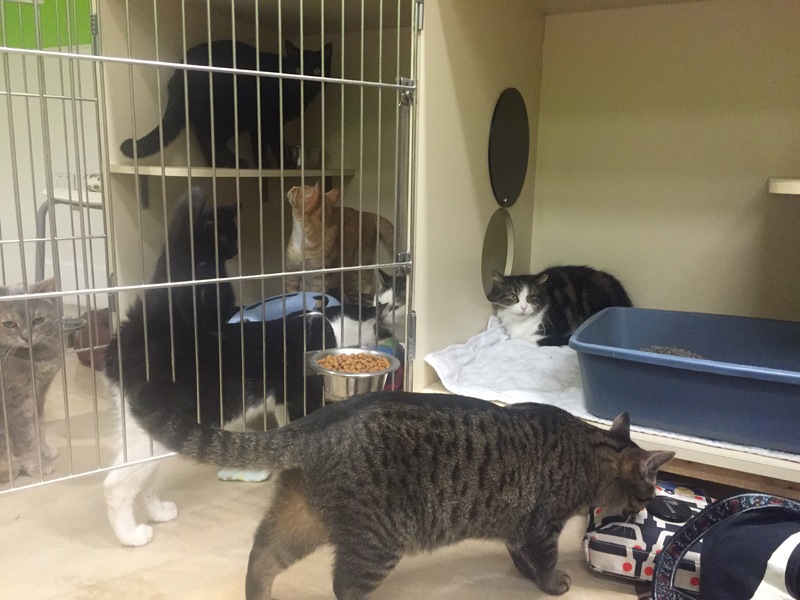 The majority of these cats are microchipped to me and I consider myself responsible for them. These days I rarely trap a “new” truly feral cat that made their way to one of our feeding stations. Any “new” cats I find are either people’s indoor/outdoor pet cats (and I just make sure the cats are spayed/neutered), or part of a colony that I learned was relocated here. The point of TNR is to reduce the outdoor cat overpopulation crisis humanely. I can never say it enough. I dream of the day of not seeing cats in every alley here. We are getting closer to that reality. Since 2010 I also started TNR at other locations outside of this area to help out other colony cat caregivers. Last year I branched out even more and started doing TNR at more locations with other people, who are also trappers, caregivers and friends, including Heather, Joann, Melissa and Patrice. Thank you! I call these sites “Satellite Colonies” since they are focused on just one person’s yard, rather than trying to contain an entire area. You can see efforts really escalated last year. 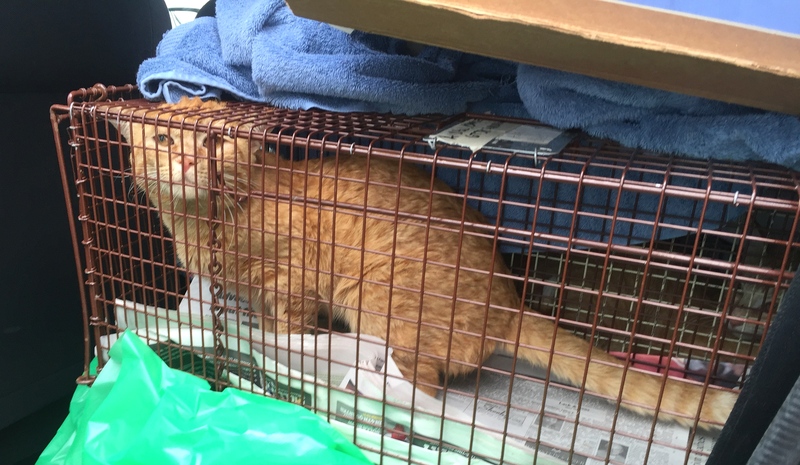 We trapped 95 total cats and kittens from eight additional colonies. Out of those cats, one died during surgery. 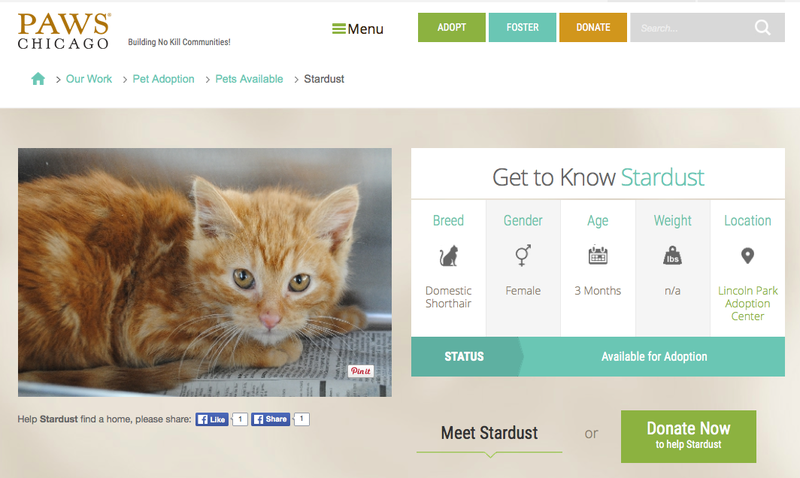 38 were adopted straight into indoor homes or admitted into no-kill shelters. That is where the collaboration with these rescuer friends was crucial. In addition, I’d like to thank Corinne, Elissa, Joann, Patrice and Robin for fostering some of these cats and kittens! This is so interesting — thanks for sharing. This is very encouraging to see your hard stats on TNR’s effectiveness. It is the only proven method of controlling feral cat population without cruelty. Keep up the good work.